Enjoy this special paradise in the South of France by leisurely browsing our catalogue. Whether it's Provence's pastel soaps in scents of lavender, almond, or rose; colorful poterie that transforms your table, or linens you can't live without... our passion for Provence has sent us searching for the very best it has to offer. Of course we would all love to tour the canopied stalls of the open-air markets, breath the air laden with the aromas of lavender and thyme, listen to the songs of the cigales in the summer evenings... our catalogue treasures will take you there. Relax and Enjoy our Spirit... Like the people of Provence who know how to live, our catalogue is for anyone who loves the good things in life. We appreciate your business. Our Catalogue is under constant revision. 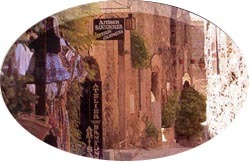 Please check back often as we are constantly adding new treasures from Provence.